The Amelia Island is a small island off of the north eastern coast of Florida. Known as the “Isle of Eight Flags," Amelia Island has had an amazing, interesting and tumultuous past, characterized by its diverse cast of Timucuan Indians, pirates, shrimpers, nobles and confederates. This amazing island exhibits Florida's history as no other areas can, adding to the lore and mystery brought forth on its shore by its amazing collection of residents both past and present. Amelia Island along with Fernandina Beach emerged as an important seaport, a legacy that today can be seen throughout its Victorian-era architecture and charming historic district. 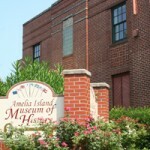 The Amelia Island Museum of History was created to help protect and share this amazing history. Sitting inside of the Old Jail, the Museum has actually acted as a battery, bringing this old building to life. Now the Museum also collects the stories of those touched by the ghosts of the old jail. Stories include mysterious voices and moans, moving cold spots, feelings of being watched, even sightings of ghosts inside the building. During a walkthrough of the building a few years ago, I experienced several events that enforce my belief that this building is very worthy of investigation. Come and walk the hallways once walked by pirates, indians, confederates, spies, thieves and other colorful characters. The investigation will be held on Sept 22, 2012 from 8pm until midnight. The investigation will be limited to 20 people. This is to guarantee the best conditions for an investigation. The price will be $50 per person. We will have equipment and psychics to help with the investigation. If you have any questions or to make reservations, please email us at ray@southernghosts.com or feel free to call us at 407 234-6611.